Everybody knows that getting outside for some fresh air and sunshine is an important part of keeping up a healthy lifestyle, but it’s important to remember that the sun can be harmful too! Sunlight contains UV rays that can damage our skin and cause long-lasting harm to our bodies. Thankfully, there are plenty of ways to stay safe and healthy while we enjoy some fun in the sun. One of the reasons people are told to get plenty of sunlight is because UV rays are vital to the production of vitamin D in our bodies. However, we only need to be exposed to UV rays for about fifteen minutes for this to occur. Any exposure beyond that amount of time can have a harmful effect on our bodies. UV rays can penetrate deep inside the body, past skin layers, and harmfully affect our blood vessels and connective tissue. Affected skin gradually becomes less healthy and begins to wrinkle. Overexposure to UV rays can cause premature aging. At worst, it can cause severe health complications and possibly skin cancer. The best way to avoid the damage caused by UV rays is to take advantage of a set of preventative measures each and every time you head out into the sun for an extended period of time. When you take these preventative measures, you protect your body from harmful UV rays and ensure your health. Popular preventative measures include wearing plenty of sunscreen (at least SPF 15), wearing a hat to shield your face and neck, wearing sunglasses to shield your eyes and wearing comfortable clothing to protect exposed skin. It’s also not a bad idea to keep an eye on the UV index. This popular tool can let you know how intense UV rays will be on a given day, as well as make recommendations on what type of protection you should use. Finally, no matter what your plans are, be sure to stay in the shade and out of the sun as often as possible. 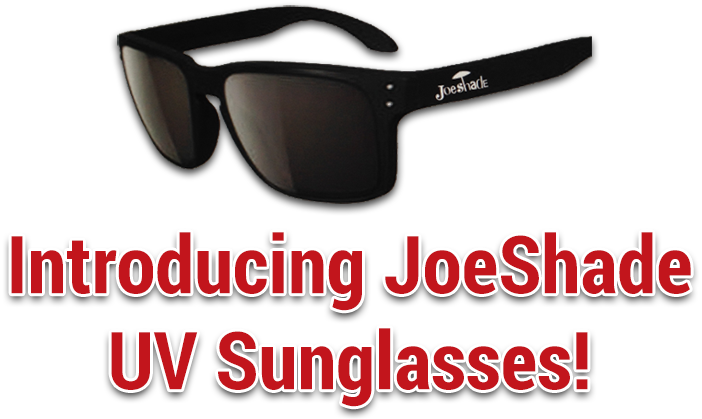 Of course, it’s not always easy to find some shade, but a JoeShade sun shade umbrella lets you take your shade wherever you go. JoeShade is portable, easy to adjust its height and provides a wide brim that keeps you comfortable and cool. Take care of yourself – stay shaded so you can go on enjoying the great outdoors without having to sweat the small stuff. Get your JoeShade umbrella today!